The Shaolin Kung fu Institute has been teaching the traditional Northern Dragon Kung fu (Lung Jop Pai) and Southern dragon (Loong Ying Mor Kiu), in the Hightstown/East Windsor area since 1972. 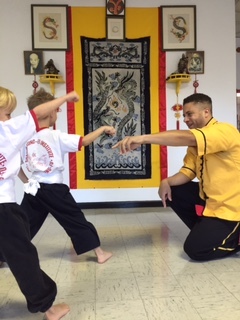 We emphasize teaching the philosophy and customs of the traditional Chinese martial arts as well as the unique techniques of this Kung fu style. Traditional training, to us, means directly learned skills passed down from teacher to student, not made-up or mixed together styles, or video-trained instructors. The institute is currently accepting serious students who are interested in dedicating themselves to learning traditional Chinese Martial Arts of the Shaolin Kung fu lineage. All students are taught by certified members of the Instructional Staff Training Program and all Instructors are certified and licensed by the Institute. We are one of the few traditional Kung fu schools in New Jersey. We emphasize teaching the philosophy and customs of the traditional Chinese martial arts as well as the unique techniques of this Kung fu style. Our classes are designed for beginners, intermediate and experienced students. We teach adults of all ages and ability levels. We have several children’s classes in which we teach children ages 5 and up. We teach self-defense, we practice kung fu! Fill out the form below for more information. Mention our web site and receive a FREE introductory class!